Just what is a sommelier and how do you use one? It’s important if you’re having dinner in an elegant restaurant with your boss, future in-laws or new squeeze you’re trying to impress. It can be stressful if you let it. So don’t let it. First, it’s pronounced SAHM-el-yay. These days it’s often shortened to “somm,” and they’re seen more and more in upscale restaurants. It’s the person who shows up with the wine list after you’ve seen the menu. In a top restaurant, he or she should be well educated about wine in general and wine-food pairings, and thoroughly familiar with the restaurant’s menu and wine list. 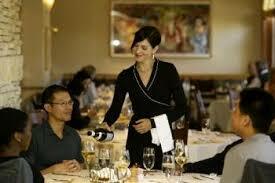 • If it’s a super-important occasion, go to the restaurant’s website before dinner and look at the menu and wine list. Get some rough ideas of what you might like to have. But keep an open mind. • When you get there, treat it as an adventure, not a test of your personhood. • Don’t — oh don’t — try to fake it. It’s the surest way to look foolish. Don’t go mano-a-mano with the somm, who may know more about wine than you do. His or her goal is to make your evening enjoyable, and being friendly and non-snooty is part of that duty. • If you know little about wine: “I’m having the roast pork and she’s having the leg of lamb. We’re not wine experts, so what would you suggest?” Here it’s important to establish a price range. You can simply say, “Something in the $30 range.” Or, to be subtle, you can point to a couple of prices on the wine list and say, “Maybe something in this range.” The somm will take your hint.